Learn more about the rules and guidelines for submitting your research. For general information about the ICPS 2019 Call for Submissions, please see Frequently Asked Questions. Symposium and Poster submissions are accepted only through the ICPS Call for Submissions, which opens in March 2018. Symposium submissions are accepted until midnight (PDT) on 15 September 2018. Poster submissions are accepted until midnight (PDT) on 30 September 2018. All submissions must represent completed work (i.e., please do not submit a proposal if the data are still pending). Only empirical research should be submitted as a poster. Submissions should discuss research that has not been presented or published elsewhere. All submissions will be reviewed and evaluated by members of the Program Committee. Although the goal of ICPS is to highlight and support integrative science, it is not a requirement that all research submission be integrative in nature. The name of the proposal submitter will not appear in any program unless the submitter elects to be listed as an author. Submitter information is only used for communications about the submission, such as notification of acceptance or scheduling information. Only the submitter can request edits to a finalized submission or request a schedule change. Note: posters are not listed in the printed program but will be available in the online planner and mobile app. An individual may be a first author on only one poster proposal. However, that individual may be a co-author/presenter on multiple poster proposals and may participate in multiple symposia. A symposium is a focused session in which individual speakers present their research on a common issue. It should have the dual goals of providing a diversity of perspectives and integrating those perspectives into a meaningful whole. A symposium must include a chair, three to four presenters, and an optional discussant. Symposia are scheduled in 80-minute time slots and should allow for discussion among presenters and the audience. An LCD projector and screen will be provided in each presentation room for symposia. Presenters must supply all other equipment for their presentation. Symposium Title – The title should be descriptive because it will be listed without the abstract on many convention materials, and attendees often build their convention schedules based on titles. When possible, the title should indicate the primary scientific question or phenomenon addressed by the speakers. Select a Subject Area to which your proposed submission is related. This is used to match your proposal with the best-suited reviewer. You may also select an optional secondary subject area. Abstract describing the symposium (50-word maximum). An Abstract is a brief high level overview of the research to be presented. Supporting summary (500-word maximum, plain-text format). A Supporting Summary should provide a brief overview of the work to be presented as well as the context of how the findings move the field as a whole. Presenter 4 (optional): name, affiliation, e-mail address, and presentation title. Co-authors who are not speaking at the convention, will be listed in the online program. Presenters will be notified of the decision regarding their submission in November 2018. If accepted, presenters will be notified of the schedule for the symposium in December 2018. Scheduling changes can be made by the submitter only. Occasionally, the Program Committee recommends that a symposium submission be considered for a poster presentation rather than a symposium. When this happens, the presenters will be notified of this recommendation, and each author will be offered the opportunity to submit individual presentations as posters. Like all other presentations, poster presentations should represent completed work. Please do not submit a proposal if the data are still pending. Posters that discuss new scientific findings are especially encouraged. When possible, the poster title should indicate the primary scientific question or phenomenon addressed by the speakers (e.g., Moral Judgment: Sociocultural and Neuroscientific Perspectives) rather than the experimental question. The title should be descriptive because it will be listed without the abstract on many convention materials, and attendees often build their convention schedules based on titles. A maximum of 15 presenters or authors may be listed with the poster submission and included in the program. Posters offer the opportunity to present data and have substantive discussions with interested colleagues. Presenters will stand with their posters while the audience circulates among the posters, stopping to discuss research that is of particular interest to them. Posters will be displayed on free-standing bulletin boards in portrait/vertical format (see Sample Poster Configuration). The maximum size for a poster is 950 mm (width) x 1388 mm (height) (37 x 54 in). 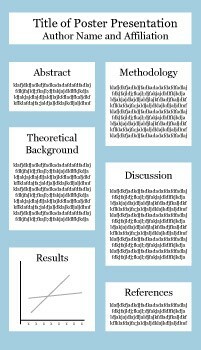 Poster presentations should incorporate illustrative materials such as tables, graphs, photographs, and large-print text, and materials should be clearly readable from a distance of 3 feet (primary text font should be 20 points or larger, and headings font at least 30 points). Posters are assigned a session number and bulletin board number. No audiovisual equipment can be used. NOTE: Posters will be scheduled in one of several poster sessions on Thursday 7 March 2019, Friday 8 March 2019, and Saturday 9 March 2019. Poster Title – The title should be descriptive because it will be listed without the abstract in convention materials, and attendees often build their convention schedules based on titles. Abstract describing the research finding (50-word maximum). An Abstract is a brief high level overview of the research to be presented. Select a Keyword that best represents your poster (limit 1). If no keyword fits the presentation, please select “Other”. This is used to assign presentations by topical clusters in poster sessions. Supporting summary (500-word maximum, plain-text format). A Supporting Summary should provide a brief overview of the work completed and include a few sentences covering each of the following: the background/theory tested, the methods used, a summary of the major findings, and the implications for the work on the field as whole. A pre-conference Teaching Institute on “Teaching Integrative Psychological Science” welcomes poster submissions for a poster session that will be held on Thursday 7 March 2019 in conjunction with the Teaching Institute. The format is the same as the posters described above. These posters should focus on methods for teaching psychology, such as particularly effective or innovative courses or course organizations, strategies (including demonstrations) for promoting active learning, ways of integrating course material, helpful use of technology, and the like. Posters are the only option for presentation during the pre-conference Teaching Institute. NOTE: There is separate registration for the pre-conference Teaching Institute. If accepted to present a teaching poster, you must register for the Teaching Institute. See Poster section above for a sample of configuration, guidelines, and how to submit a poster. Poster submitters and presenting authors will be notified of the decision regarding their poster on a rolling basis, and if their submission is accepted, they will be notified of the schedule for their poster in December 2018. NOTE: Only the submitter of a poster can request that an edit be made to a finalized submission. With all submission formats, including posters, the Program Committee retains the right to request additional information, ask that changes be made to improve a presentation, or to decline to schedule a presentation the Committee does not find relevant to the meeting or that does not follow the guidelines for submission. No changes can be made after proposals have been submitted unless the Committee has specifically requested that change. All program participants must register and pay the appropriate registration fee. This rule applies to anyone attending and/or presenting at ICPS 2019. You can register on site, but early registrants receive a discounted rate before midnight (PDT) on 15 February 2019. More information about registration is available online. The Association for Psychological Science (APS) is pleased to provide support for attendance at the International Convention of Psychological Science (ICPS). Awards are intended to offset travel expenses. To be eligible, an applicant must be the first author on an accepted poster or a presenter in an accepted symposium and be either a current student or have received their terminal degree in 2013 or later. To apply, submit your research and indicate your interest. Learn more about Travel Grants online. The Symposium Travel Grant Submission Deadline is 15 September 2018. The Poster Travel Grant Submissions are now closed. The Deadline was 15 June 2018.